Labour Leader Jeremy Corbyn at a Rally to Remain campaign event in Westminster, London, May 14, 2016. Dominic Lipinski/Press Association. All rights reserved.In twenty years’ time, we will look back on Brexit as a moment of terrifying global irresponsibility. We live in a world of creeping fascism in Russia, Turkey, China, Trump’s America not to mention the tendencies inside Britain, especially among the hard Brexiteers. The European Union currently represents a beacon for democracy and human rights. Of course, it is dominated by a neo-liberal ideology that threatens to undermine the euro-zone and with it the democratic values for which it stands; developments in Central Europe and the recent elections in Italy are a painful reminder of the dangerous possibilities. Nevertheless, there are tendencies for reform inside the European Union and if a Corbyn-led Labour Party were to win the next election, there is a unique – indeed a once in a lifetime opportunity – to reform the European Union and this means an opportunity to save us, Europe and perhaps the world. The current nostalgia for Britain’s role in WWII seems to neglect the fact that this was a struggle for democracy, human rights and decency and not just about nationalism. But we are so obsessed with the domestic British debate despite all the talk of a global Britain that nobody seems to be discussing or trying to diagnose the frightening scenario of everything going wrong and our role in that scenario. The current nostalgia for Britain’s role in WWII seems to neglect the fact that this was a struggle for democracy, human rights and decency and not just about nationalism. If we care about those values now, we should be worrying about the future of Europe and the world and how what happens in the rest of the world will affect us. A pamphlet published by Another Europe is Possible this week makes the argument that instead of fretting about how bad Brexit will be for Britain, we need to think about what a Corbyn government inside Europe might mean for the future of the European Union. The pamphlet sets out a reform strategy for the European Union that is realistic to achieve if a Corbyn government were to ally with socialists across Europe. Such a reform strategy would enable us to address the big global problems of today, and this in turn may well be a necessary condition for implementing the Corbyn-McDonnell programme. There are already tentative moves away from dogmatic neo-liberal economic policies, which successive UK governments were at the forefront of pushing. President Macron is talking about reform of the eurozone including a common European budget and there is a possibility that his proposals will be met more warmly by the new Social Democrat Coalition in Germany. The left-wing Portuguese government has demonstrated how an anti-austerity policy can dramatically improve economic performance. There are proposals to close tax havens for multinational corporations and a proposal for a common consolidated corporate tax, something the UK has strongly opposed in the past. New proposals to stop undercutting, whereby companies deliberately recruit workers abroad under the conditions in the countries where they are recruited to reduce costs, have just been passed and will mean that it will be no longer possible to use migrant workers as a way of putting putting downward pressure on wages. And there are proposals for a tax on financial transactions as a way of controlling financial speculation, again a proposal vetoed by the UK in the past. Yet these proposals may be difficult to implement without at least one major power seriously committed to them. For example, in the wake of Brexit, some countries are engaging in beggar-my-neighbour policies in order to take over the UK position especially in financial services. A Corbyn-led government could be key to making these reforms happen. If Labour were to pursue a ‘Remain and Reform’ strategy, there is a chance to remake Europe and initiate a process of taming and controlling the dark forces of globalisation. The same is true for those areas where EU policy has, in the past, been relatively progressive – digital rights, climate change, and ending global conflicts, for example. Thanks to active protests across Europe, EU policy on digital rights, defending online privacy and the ownership of personal data, has been rather progressive – yet without continued active engagement, along the lines of the Labour Party’s Digital Democracy Manifesto, there is a risk that this might be undermined by anti-terror legislation. In the case of climate change, there is considerable momentum for far-reaching efforts to keep climate change under 2 % including the ‘Clean Energy Package for All Europeans’ and the ‘EU Roadmap for 100% emission cuts by mid-century. These initiatives would mean a massive transformation of the European economy affecting almost every sector. But, given powerful vested interests in our current carbon based economy, it won’t happen without substantial pressures from parties and movements across Europe. As for ending global conflicts, the new global strategy presented by Federica Mogherini to the European Council the day after the British referendum, envisages an external security policy aimed at human security (the security of people and the communities in which they live) rather the security of borders. This policy was formerly blocked by the UK who preferred the geo-political approach of NATO and so is now moving ahead. Nevertheless, it requires much stronger political backing and more of the kind of resources in which the UK has a comparative advantage. 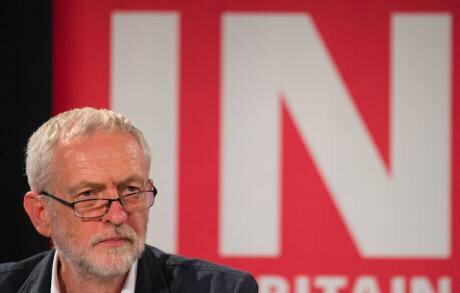 Finally, a Corbyn-led government could change the conversation about immigration. Anti-immigration sentiment promoted by unscrupulous politicians, it can be argued, produced the refugee crisis. We live in a world of migration and it is more or less impossible to control. What is more Europe with its aging population needs migrants. Instead of creating a border security complex in which smugglers and border guards are enmeshed in an impossible business that fails to prevent the deaths of thousands of migrants in the Mediterranean, we need a policy of managed migration as was actually proposed by the European Commission but opposed by member states – one that involves a resettlement policy across the continent. A Corbyn-led government could push for replacing the current exclusive and dangerous securitised approach with one based on humanitarian and development considerations. We need a policy of managed migration as was actually proposed by the European Commission but opposed by member states – one that involves a resettlement policy across the continent. A reform strategy of this kind offers the possibility of transforming the global model of development from the old US-led model based on mass production and the intensive use of oil, to a new green, digital, decentralised and socially just set of arrangements. This is no longer, if it ever was, something that can be pursued in one country. On the contrary, a post-Brexit Labour government could easily be derailed by predatory action from larger economic blocs and financial markets. And the alarming tendencies for European disintegration, right-wing authoritarianism not to mention criminal and ethnic violence are likely to infect us as well. But if Labour were to pursue a ‘Remain and Reform’ strategy, there is a chance to remake Europe and initiate a process of taming and controlling the dark forces of globalisation.